Hundreds of shoes need to be sourced or maintained over the summer. Cheryl Knight has the hands behind the boots in our Season Appeal photos: she is the Footwear Supervisor at the Royal Opera House. 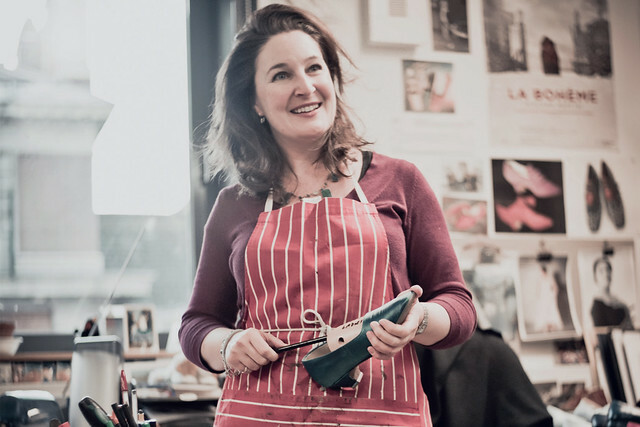 Cheryl and her colleagues are responsible for sourcing and maintaining shoes for all the singers in any opera production. Each shoe needs to fit their owner perfectly, so that the singer can be safe and comfortable and sing as well as possible. Uncomfortable shoes are a terrible distraction! When singers join the Royal Opera Chorus, they are kitted out with the five or six pairs of shoes they’ll need for their career on stage. Men wear black shoes, boots, character shoes, knee boots or jazz shoes, and women have Victorian-style ankle boots, character shoes, court shoes, jazz shoes, a generic ‘peasant’ shoe and sandals. It’s an awful lot of shoes! Over the summer, these shoes are maintained and repaired, ready for the new Season ahead. They need polishing, soles might need re-sticking and broken or frayed shoelaces will need replacing. Over the summer, the team in the Shoe Room get through five pots of polish and a tin of shoe glue. We spoke to Cheryl ahead of her preparations for 2014/15: The Royal Opera. Cheryl, what are you most looking forward to in The Royal Opera’s 2014/15 Season? It’s extraordinary to see what’s ahead. Just the most amazing singers will be here: Plácido Domingo, Eva-Maria Westbroek, Jonas Kaufmann (always a favourite, for obvious reasons! ), Anna Netrebko… the list goes on and on. They will all be visiting the Shoe Room for fittings and repairs. I’m intrigued to see the new production of Rise and Fall of the City of Mahagonny from Kurt Weill. I’m a real fan of Anne Sofie van Otter so am very excited to see her returning to Covent Garden for this. But my absolute favourite for next Season is Il turco in Italia – I just love it! Such a brilliant production, funny and sunny, and again, an extraordinary cast. The shoes – like the rest of the costumes – are colourful and flamboyant. The first time we did this production, Fiorilla was sung by Cecilia Bartoli and I was rather star struck. One day the designer took me up to the Wig Room and asked them to take photos of my hairstyle. The next thing I knew, a wig had been made up for her that was a perfect replica of my hair! And bizarrely, several months later, one of the wig makers asked if I’d visited a particular tiny village in Cornwall recently, which I had. She’d seen me there, but only from behind, and recognized me from my hair because she’d made the wig and had been studying my hair for so long! What’s been a memorable production for you? I was delighted when The Tsarina’s Slippers was put on in 2009. 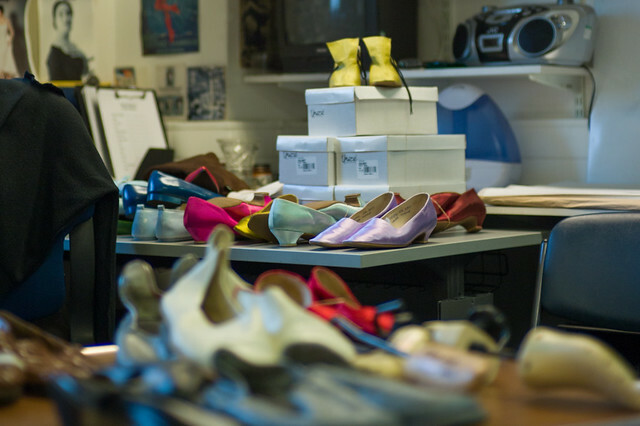 Often our work goes unseen, but here was an opera all about the shoes! A thousand crystals covered the Tsarina’s slippers, which had to be topped up after every performance as they had a habit of pinging off mid-performance. And at the end of the opera, the hero and heroine headed off into the sunset riding a sleigh in the shape of a giant shoe – glorious! And how did you end up working in Opera Shoes? I started at the beginning of the 2003/4 Season, so next Season will be my twelfth. I actually started with a dressing role for The Nutcracker and then in the shoe department as holiday cover, where I’ve been ever since! My grandfather was a master cobbler and I have always loved shoe design, so working here feels completely right to me. It’s amazing to play a part in our operas, even if I don’t appear on stage! Everyone has a part to play. Play yours today. We are inviting gifts to our Season Appeal to contribute to the essential and behind-the-scenes preparatory tasks at the Royal Opera House this summer. Over the coming weeks we’ll be exploring the faces behind the five featured tasks, so keep checking our website for further updates. Listen to Cheryl interviewed on BBC Radio 4’s Midweek last year. Shoes that we could display on loan or permanently.